The Cherry used for this custom watch box has a subtle pattern with multi-hued colouring. The scene in the centre of the top was bordered with Wenge bands which were accentuated with veneer-thin edges of black-stained Poplar. 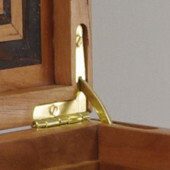 The upper was divided into three equal compartments, separated by solid Cherry dividers. The drawer was left without compartments to allow maximum flexibility for storage of watch bands and parts. Drawer sides were made from solid Cherry. 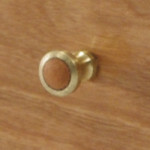 Solid brass drawer pulls with matching Cherry wood inserts. Sides were solid 1/2" (13 mm) thick Cherry. Top was made of 1/8" (3 mm) Cherry, bordered with Wenge and Cherry, and laminated to both sides of 1/4" (6 mm) plywood. This construction not only makes the interior of the top as attractive as the exterior, but also prevents warping of the top. Drawer sides and dividers were solid Cherry. Interior was lined with a luxurious faux suede. The upper level was about 1 7/8" (4.8 cm) deep. Interior dimensions were about 10 1/2" x 7 1/4" (26.7 x 18.4 cm), divided into three equal compartments. The drawer was about 1 1/8" (2.9 cm) deep. Interior dimensions were about 9 3/8" x 6 5/8" (23.8 x 16.8 cm).